I read this book immediately after reading another hot cowboy story, which I should never do again! It is really hard to compare similar characters back to back, especially when you are so mch in love with the first one. That's actually why it has taken me so long to write this review. I needed to reflect on it and give it a fair shake. 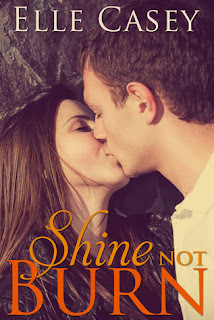 Shine Not Burn opens with the main character Andie, a hot shot lawyer who controls her own destiny and is following her life plan to the letter. Nothing is going to get in the way of her schedule. She is the ultimate type A, which is probably why I love her, I can relate so well to her. Her best friends bachelorette party is in Vegas and despite her reservations about going she eventually gives in. They say, "what happens in Vegas", but in Andie's case it catches up to her. Days before her own wedding to Luke (aka Puke) she discovers she is already married. How in the heck can this be? The control freaks gets drunk one night 2 years ago in Vegas and now her whole life plan is hanging in the balance. Freaking out, Andie leaves for Oregon to find her mystery husband. Cue swoon worthy cowboy Mack. I will admit it, Mack is pretty mean to Andie as first, but attraction and love causes us to do the strangest things. After a short stint in Orgeon Andie is now more torn than ever. Give up her organized planned out life as a lawyer and live spontaneously or go back to being hte person that controls everything. Which will she choose? Go check out Sine Not Burn for yourself and find out!